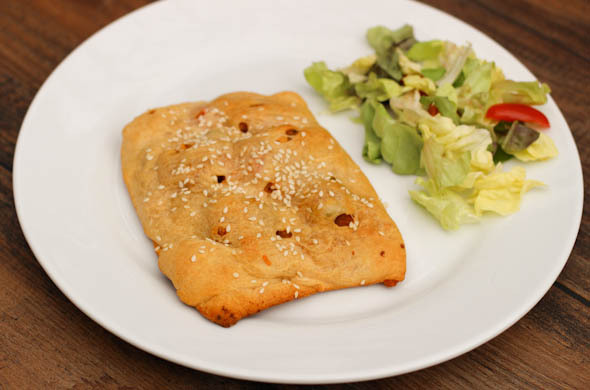 These cheeseburger turnovers are an appetizer turned into a main dish! 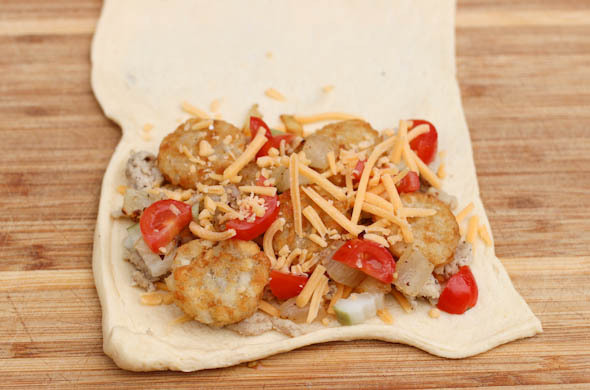 Follow how my mind worked: I started out with the idea of a cheeseburger eggroll but then decided I really didn’t want to fry anything so I went with crescent dough. I then the more I thought about tiny ones made me think that it’d be way faster to make fewer but big turovers/pockets. Thus, my cute app became dinner! There’s a key ingredient to make them so much more fun than burger filling into pastry…. I put tater tots into them! Those become such a fun and a bit unexpected bite! Like burgers & fries! I prepped and partially baked these in advance, then just warmed to eat come dinner time! I loved these burger pockets and would totally make them again. Maybe next time they’ll even get to live out life as an appetizer! Bake the tots according to the package. Saute the ground meat until it is cooked through seasoning with worcestershire sauce, salt and pepper. Then remove the meat and saute onions in the same pan until they are translucent and getting golden. Unroll the dough and slice into 4s. Top with cheese, ground meat, tots, onion, tomato, pickles, and more cheese. Fold it and pinch or use a fork to close all the edges together. Poke holes onto the top to vent and bake for ~15 minutes (bake according to the crescent dough packaging). Brush with olive oil and sprinkle with sesame seeds a few minutes before they finish cooking. These are so fun and a great dinner to prep ahead of time! I almost did a special sauce drizzle inside – maybe next time. 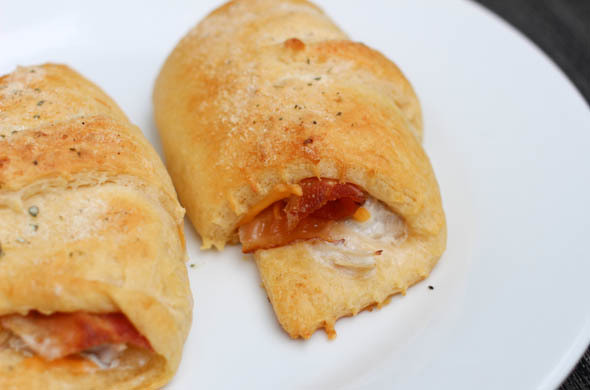 If you like these, then you’ll love Chicken, Bacon, Ranch Turnovers or Chicken Parm Turnovers. 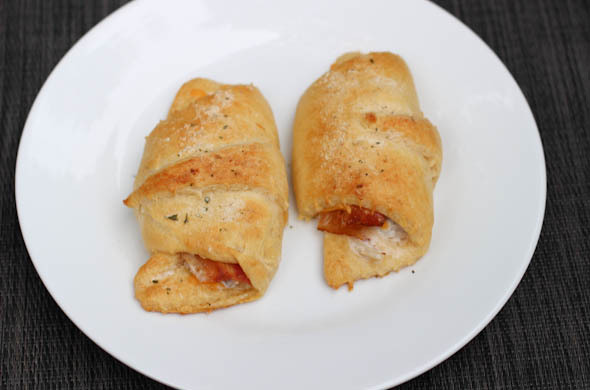 I made the Chicken Parm Turnovers as mini apps for a holiday party and they were a hit! Making fun dinners in advance is the story of my life right now. I want dinners to be varied but that time between daycare pick up and dinner is a rush. Throwing dinner in to warm up while I get to change out of work clothes, cuddle the baby before she’s ohh-so-ready for her post-daycare nap, play or at least converse while the preschooler plays, encourage hand-washing, and dodge the dogs who are underfoot to be fed- is in-ter-est-ing to say the least. I’m mostly into the Superbowl for the snacks and commercials so my home team playing is just a perk. I did watch to see who would go to the superbowl! If you haven’t planned your snacks, get on it! I have quite a list and need to narrow down a bit! We aren’t having a crowd so I’m still assessing what snack food we want to have. Our preschooler looooves when we have snacky dinner- as in, not a traditional meal. Maybe we’ll have something with him and then more when kiddos are asleep an hour into the game! 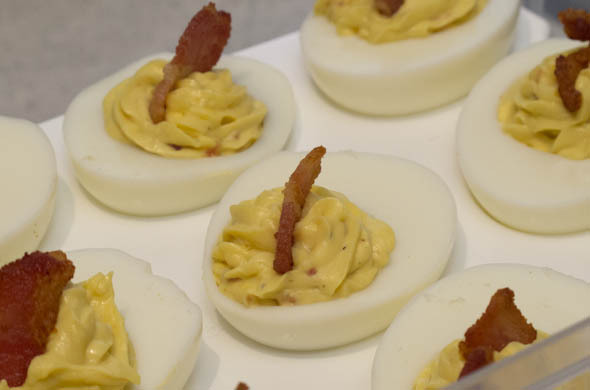 Bacon Ranch Deviled Eggs will be gone before you know it, and are a good snack to make ahead of time or to bring since they don’t need reheating! Seriously, people chuckle when they see deviled eggs yet they’re always gone before I know it whenever I bring them somewhere. I’m sure I’ll make some since they are easy to just make a few of. Skip the veggies with hummus and put this Greek Dip together- no cooking required! 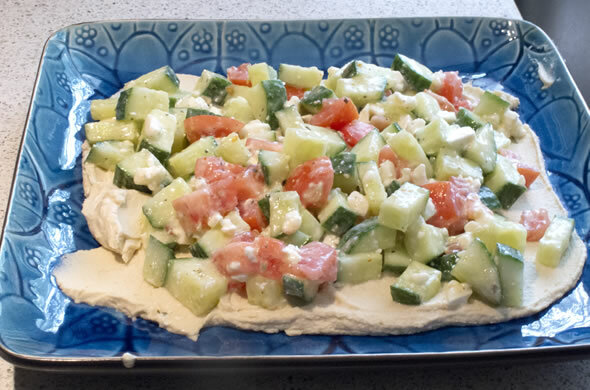 Layer hummus on the bottom, top with chopped cukes, tomato, feta, and Italian dressing and pita chips or wheat thins to dip. 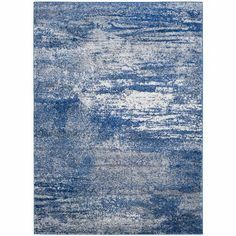 It is a crowd pleaser and couldn’t be easier. Packing tip: bring the hummus, chopped veggies & feta, and dressing all separate and assemble in 1 minute when you arrive at your viewing party. I’m thinking about pigs in blankets (after finding mini chicken sausages! score!) and a dip seems necessary. What else, well, only time will tell! A whole bunch of flatbread-ish pizzas on naan are great for a crowd. Build-your-own anything is fun- build your own sandwich/panini would be a festive option. I’d love to do build your own nachos with queso in a crock pot if I were hosting a group! Happy snacking! You neeeed this super easy and fun dinner in your rotation for December. 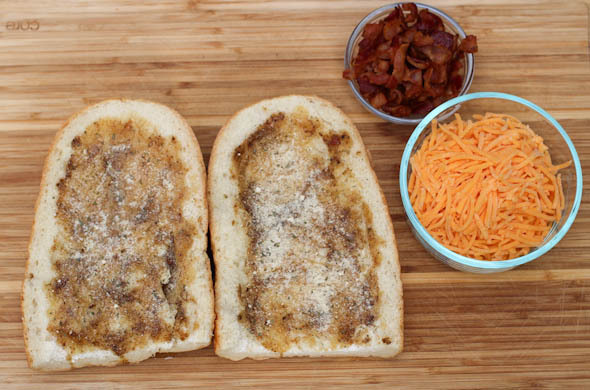 It is delicious, a great use of leftovers, and couldn’t be easier. What else could you look for from a weeknight dinner!? We have something Mexican about once a week so I popped a small portion of pulled pork into the freezer for occasions such as this. Add gather some queso sauce, tomato, avocado, green onion, salsa, and cheese onto waffle fries and you’ve got yourself a meal! Taco night gets recreated for a whole different feel. 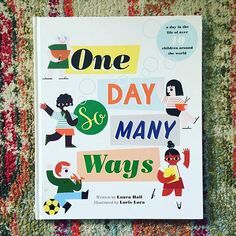 I’m working to ensure foods aren’t always the same for my little one…I don’t want him thinking tacos are always one way, or cheese is always in string form, etc. Having tacos/burritos/quesadillas/etc help ensure he sees ingredients he’s familiar with in another format so it is still approachable. I took a similar tactic for a recent salami & cheese calzone being his fav sandwich flavors. I have adventurous eaters in our family, but doesn’t everyone just want a crowd-pleasing, slam-dunk of a dinner in the rotation, right? Pssst. These would totally fill a group for a weekend lunch, after sledding, as a quick meal before some festive holiday gathering, or watching a game (<- jeez, I sound like I host football parties non-stop. I just like how those games bring out the snacks!). Bake the fries according to the package. 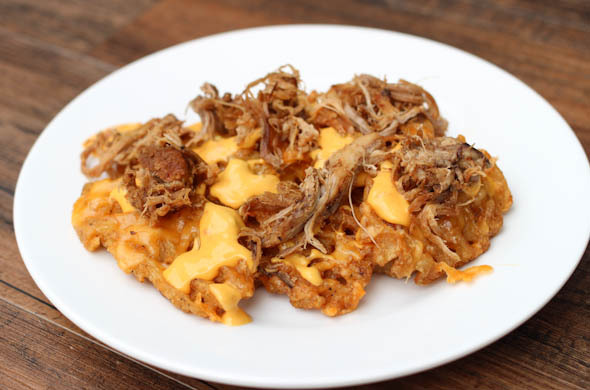 While they bake to a crisp, pan fry the shredded pork to brown a bit and warm the queso. Sprinkle the shredded cheese on the waffle fries and return to the oven to melt. Drizzle some queso onto the fries and top with pork. Serve and offer the toppings of tomatoes, avocado, green onions, and salsa as a top-your-own station, or top the whole platter and let everyone dig in. 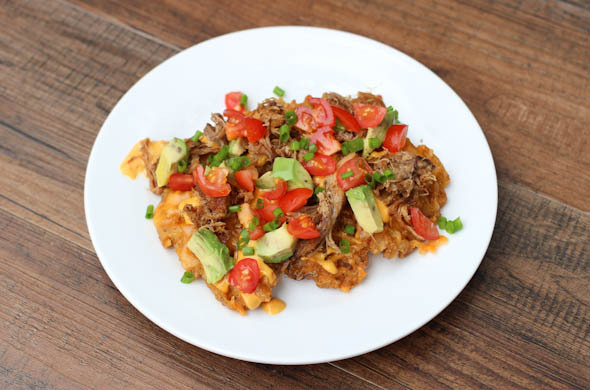 These are plate and fork nachos, which are the very best kind! They are truly loaded and so filling- as in, ours were on salad plates instead of dinner plates! 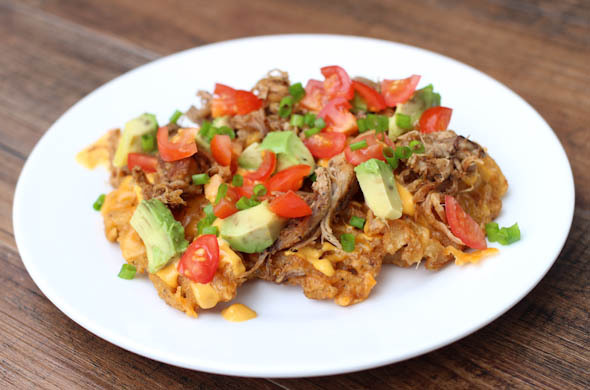 Loaded waffle fries are definitely enough to be a meal. Our toddler thought it was a super fun dinner! I’d argue that the baked fries aren’t really a far reach health-wise from the rest of it being a taco or regular nachos. These are more filling so plan portions accordingly! This uses up the remainder of queso and a small amount of pork & cheese so it reminded me not to underestimate what can become a meal! Vegetarian-ize them swapping pork with black beans and saute some bell peppers or add whatever toppings would go in your tacos! 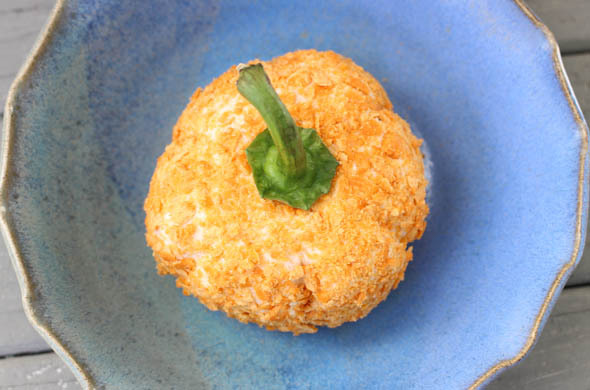 This adorable (and seasonable) appetizer is a year in the making. I made this forever-ago but didn’t get to blog it soon enough and then it seemed weird to encourage anyone to shape food into a pumpkin shape once the mindset is onto the next holidays! It is so stinking cute, super easy, and delicious. Bring the cream cheese to room temperature. In a food processor (or pounded in a ziplock bag), pulverize the cheez-its. Then remove most of it, leaving ~1/4 cup in the food processor. Add in the cream cheese, cheddar, garlic powder, Worcestershire sauce, and salt & pepper. 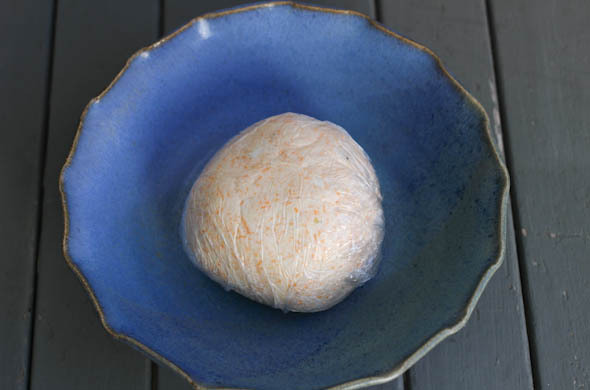 Remove and form into a ball, wrapping in plastic wrap. 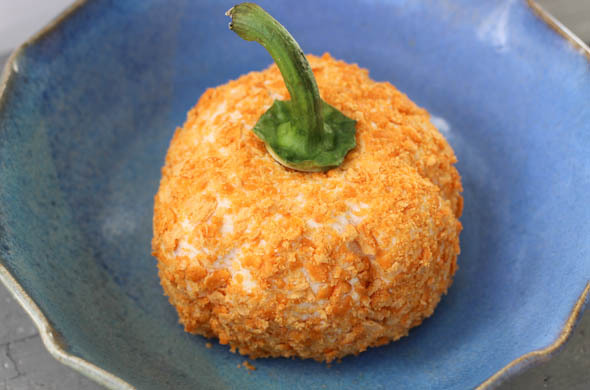 In the wrapped ball, make pumpkin-like ridges from the top to bottom, about an inch apart. 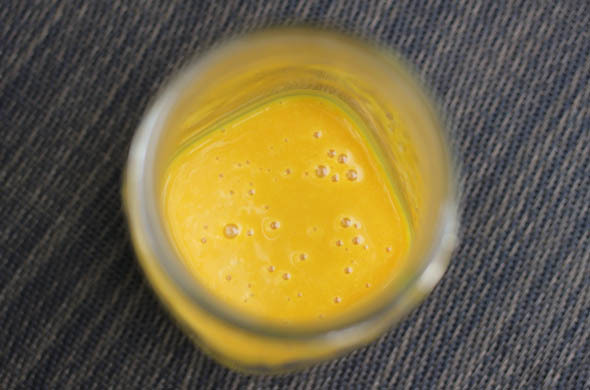 Refrigerate for 30 minutes, or until serving. Before serving, unwrap and roll it in the remaining cheez-it crumbs. Add the bell pepper stem and serve with crackers. I loved this, and it is show-stopping cute. I like the simplicity of it but it isn’t shy on flavor. I brought it to a get together and just rolled the crumbs before serving. I’ll totally make this again. Orrrr make this cute carrot one but shape it like a pumpkin. So festive! This one is so fitting for October AND November. These little buggers are so cute and delicious. 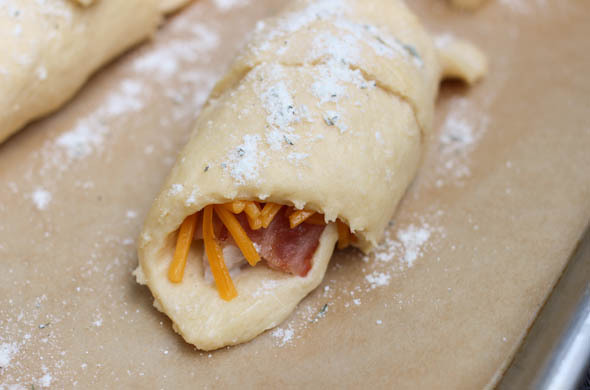 Crescent rolls are getting stuffed with, yup, you’ve guessed it, chicken, bacon, ranch, and cheddar. They became an instant dinner with the help of pre-cooked bacon and some rotisserie chicken. Serve these with some salad and they’re dinner like a hot sandwich, or on a big platter with ranch as an app! They are an ideal weeknight dinner or a fun one for kids to help assemble. 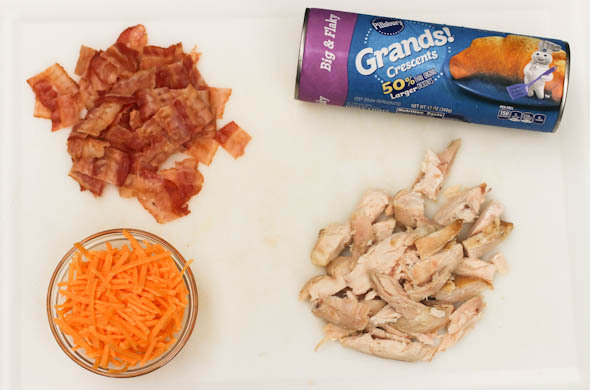 Preheat the oven according to the crescent roll instructions, then shred the chicken and chop the bacon. Mix the chicken with the dressing. Unroll the crescent dough into the perforated triangles. Top the wide part of the triangle with chicken, bacon, and cheddar. Then carefully roll towards the point. Sprinkle ranch powder on top and place on a baking sheet lined with parchment, a baking mat, or sprayed generously with non-stick spray. Bake 10-15 minutes, as directed by the crescent packaging. These are a great use for leftover chicken if there isn’t a lot of it and they reheat well in the oven or toaster oven. Pop any leftovers into the freezer for another day’s quick lunch or game-time snack….though, I don’t think you’ll have any leftovers! 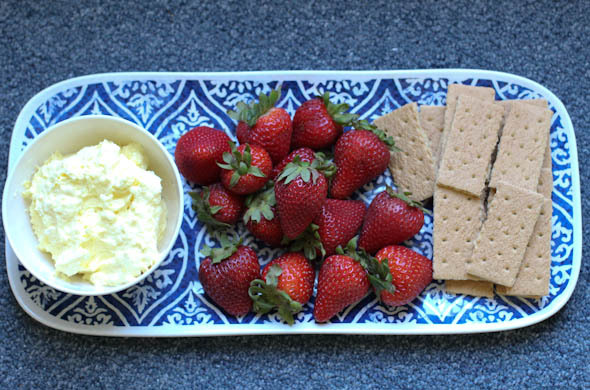 On my quest for more appetizers up my sleeve, I went lemon-y for a dessert/fruit/brunch-ish dip and it couldn’t be easier. I love that it can be prepped ahead of time, or mix it up and eat it immediately! I wanted to go all-out and make a huge board overflowing with dippers for it, but then again, I’m 36 weeks pregnant, hot, always tired, and I wasn’t feeding a huge crowd. 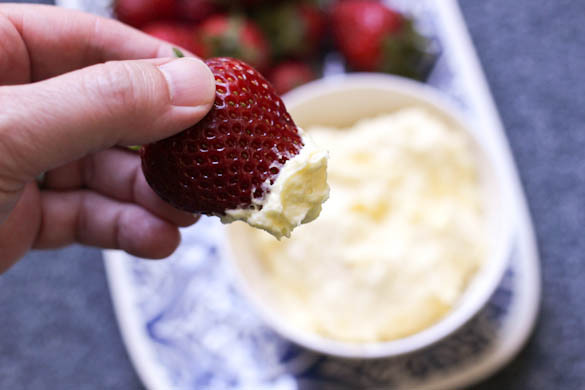 This hit the spot with just strawberries and some graham crackers to dip. 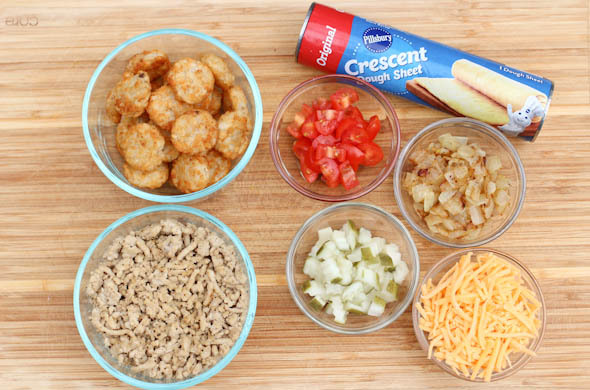 Add all the dip ingredients into a bowl. 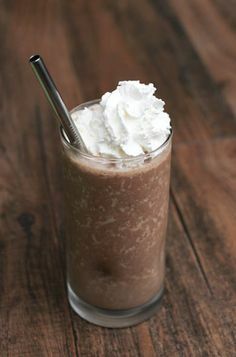 Whip with a mixer (or food processor or blender). 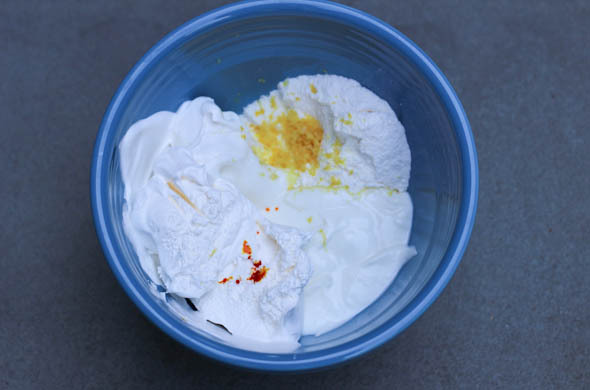 Taste and add more fresh lemon juice if desired, or thin it a bit more with additional yogurt/cool whip if desired. Enjoy! Or refrigerate until serving. 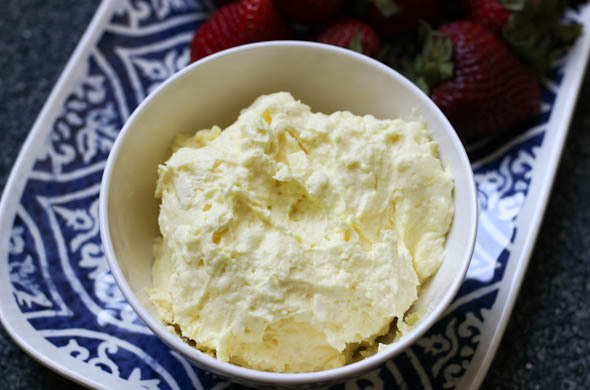 This totally hit the spot for being fresh and bright but creamy and very dip-able. I didn’t think of it fast enough, but any leftovers would be great between graham crackers like an ice cream sandwich then wrapped individually in plastic. Leftovers of everything would make fun individual trifles! I added the yellow since the lemon powder isn’t all that yellow and I wanted it to pop. This is an easy one to prep the night before and bring to a summer gathering or to serve when guests arrive! My little one was napping when I served this but he tasted when I made it and liked it. I think it’d be an easy excuse for a dessert! Go all out and make a huge & beautiful board of fruit, cookies, and treats and share with me! 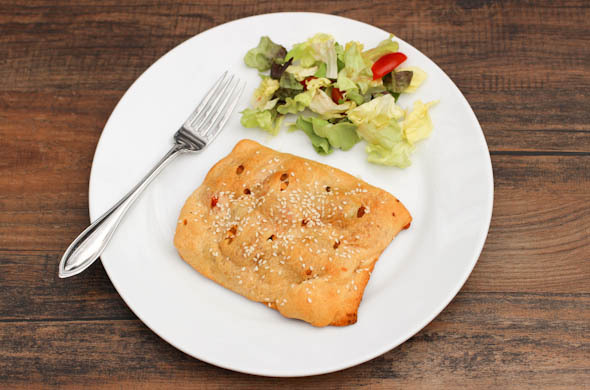 This delicious dish skates the line of garlic bread or maybe even a flatbread. This is so good and so easy. 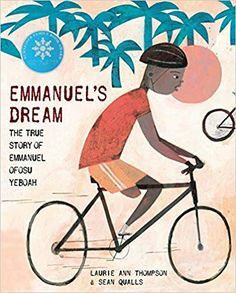 Share with others – everyone will love this. We ate it for dinner with some salad but I can definitely see it being a fun app or side. The garlic cooks in the bacon drippings and butter meaning the full flavor of the bacony-tidbits goes onto this. It mean the crunchy brown bits from the pan soak into the bread. Chop then pan fry the bacon until crisp. Spoon onto paper towels to drain, but reserve the grease in the pan. Preheat the oven to 375-degrees. Slice the bread and pop it into the oven while the oven preheats- just to start to warm through. Add the butter and garlic to the pan with the bacon drippings. Cook over medium-low heat for about 3 minutes. 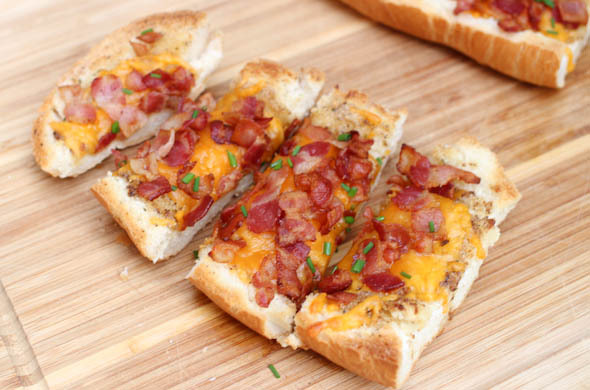 Spoon over the bread and then top with ranch seasoning, cheese, and bacon. Bake for 10 minutes, until cheese melts and the bread gets golden around the edge. Optional: Sprinkle chives over the top. Slice into 1 inch slices. Enjoy! This was a really fun one. We had it for dinner with some salad and it totally hit the spot. I loaded up the bacon because, well, it is bacon! The little one ate all the bacon off his pieces first, then ate the rest. 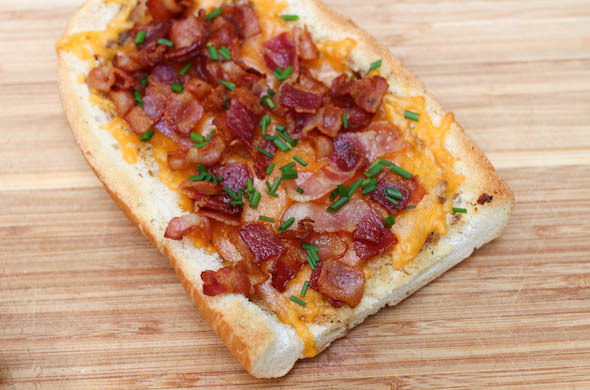 I had the bread in the freezer and always freeze bacon, so this was easy to pull together. 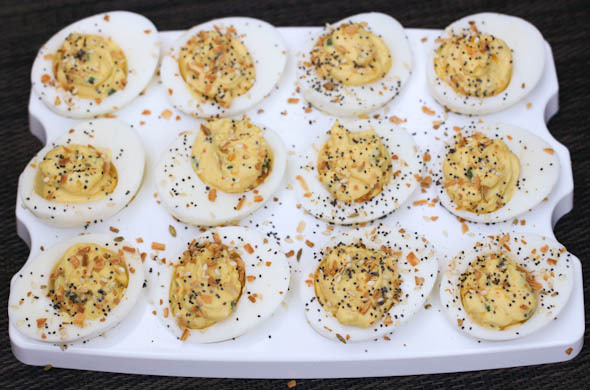 The deviled egg variations are endless! I whipped these up for a staff coffee social at work. 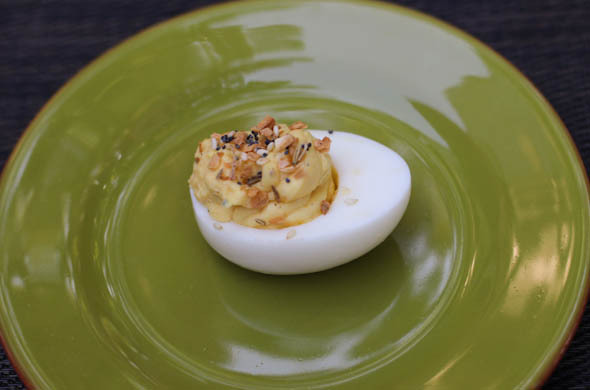 I put a cream cheese & everything bagel twist on traditional deviled eggs and they were great! My trick to prep ahead, without them too far pre-prepped, was doing it in stages. I hard boiled the eggs, then another time I mixed up the filling and left in a closed zip-top bag, then piped the filling and added the topping just before serving. Hard boil the eggs and then let them cool in ice water. Peal the eggs, slice in half, and pop the yolks out into a bowl. 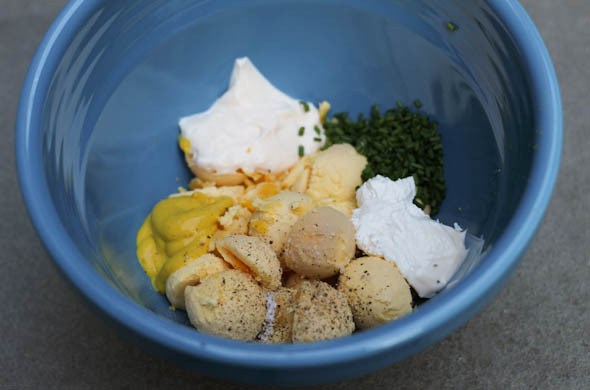 Add in the mayo, cream cheese, mustard, chives, salt, and pepper. beat the filling or mash with a pastry blender. Sprinkle them with everything bagel seasoning. I loved these! They were a good mix amongst fruit, coffee cakes, biscotti, quiche, and bagels. These are a great bite with everything else everyone will nibble on. The crunch on top was so perfect. I wanted to add a little bacon on there but wasn’t sure about how many vegetarians might be in the mix and I didn’t want these to be too much. Next week I have Mr. J’s 8th annual birthday burger to share and let me tell you, it was a gooood one! The little one loves all dip-able things and loves honey mustard the most. I don’t always make it, but it is seriously the easiest dressing to make. 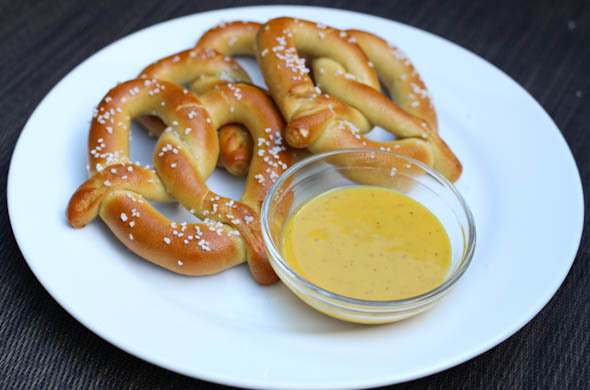 Quite awhile ago I brought it to a dip party with soft pretzels from the freezer section and they’re so fun since nobody has them all the time. This combo is the perfect app. This time, I whipped some up for a weeknight dinner, along with some cucumbers and chicken sausage and it was a hit…likely because it isn’t something we have often! Whisk together the honey, mustard, juice, mayo, garlic and dijon. Or add into a jar and shake. Taste and adjust as necessary. Refrigerate until serving, for about a week. I like the dijon in there for more of a mustardy kick but I don’t always include it. The consistency is like dressing, and my leftover was used as salad dressing. 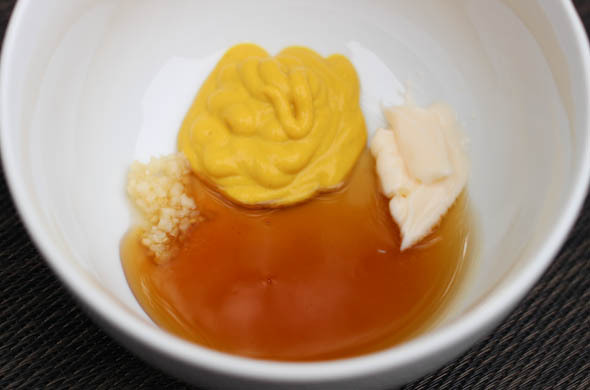 Adding more mayo will make it thicker, more for use like a dip, and mellow out the sweet honey and the strong mustard. Those freezer soft pretzels need to be stocked in my freezer more often. They’re so fun and bake for ~4 minutes! I’m back! I had a few dishes I wanted to make and blog last week but I didn’t quite get to them. Now they’re all ready so buckle up! 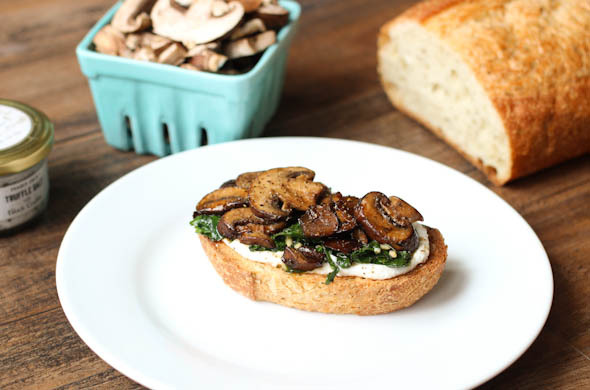 Today’s toasts were such a fantastic and balanced lunch and would also be great on little toasts for an appetizer. Heat a pan to medium heat and melt the butter. Add in the mushrooms and sprinkle on salt and pepper. Stir to caramelize on each side for about 3 minutes. Add in the marsala and worcestershire sauce. Stir until evaporated, about 2 minutes. Toast the bread, ensuring it gets brown but soft enough to bite through. Bake in the oven if making a whole batch. 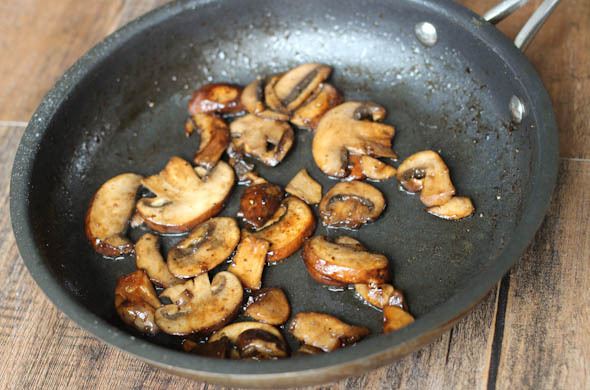 While the bread toasts, remove the mushrooms from the pan and use the same one for the greens. Saute the greens in a drizzle of oil for about 2-3 minutes with the garlic and some salt until just wilted then remove from the heat. 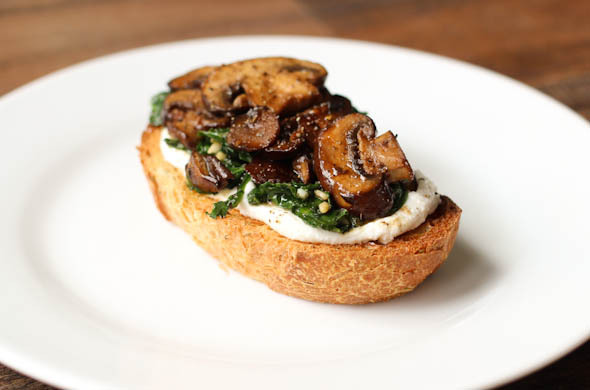 Spread the ricotta onto the toast, then add greens, then add mushrooms. Finish with kosher salt, sea salt, or a drizzle of oil. I had truffle sea salt. The marsala flavor here was so great with garlicky greens, and creamy ricotta. I liiiiive for ricotta but if it isn’t your jam, go for cream cheese, or goat cheese, or whatever you like. Any kind of mushrooms would be great here. Marsala could get swapped with cooking sherry or a touch of balsamic vinegar- go for big flavor, the mushrooms will soak it up with the butter. Yum! 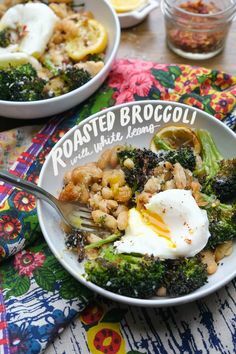 I had this for lunch but would also go for a little more subtle flavors to be a fun savory breakfast too. This was a great little lunch using a bunch of ingredients I already had around. The greens are a mix I use for smoothies. Once they’re on the verge of hanging out in the fridge too long I pop them into the freezer. Then I break them off in chunks. I found really awesome rosemary olive oil bread in the discount area so I knew it had to be toasts. Earlier I took the little one to the zoo and had a banana and cheese stick at our zoo picnic so when I got home I was ready for something more.